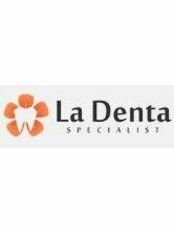 La Denta Specialist is a Dentistry Clinic in Kelapa Gading, Jakarta. The clinic is visited by doctors like drg. Poetri Febrinadya,drg. Nurina Anggraeni Pratiwi and drg. Sandra Olivia Kuswandani. The timings of La Denta Specialist are: Mon-Sat: 10:00-20:00. Some of the services provided by the Clinic are: Scaling / Polishing,Dental Braces Fixing,Teeth Reshaping,Dental Ceramics and Artificial Teeth etc. Click on map to find directions to reach La Denta Specialist.